Pam’s Pictorama Photo Post: To my surprise this photo is tiny! I was shocked to find it is only about 2″x 3″ when it arrived in the mail. However, it is full of information and has blown up nicely. It was, of course, the cat costume that first drew me, although Little Red Riding Hood, or whoever she might be, is mighty fine as well! The photo came from Britain which means that, although this could be Guy Fawkes, it is not Halloween. Upon reflection the garden, which is lovely, and the houses beyond, are very suburban British in nature. Nothing was written on the back and in its own way it is an old but timeless image. I have it in my mind that the Brits do costumes and dress up well, but I am having trouble pin pointing what makes me think that. A number of years ago I did stumble across a furry hairband with shiny sequin cat ears around Halloween which I purchased. When I put it on and showed it to the cats, Otto and Zippy at the time, they had the funniest reaction – they backed away from me very slowly, never taking their eyes off me. Finally they just turned and walked away, as if they were shaking their heads, appalled. I thought later, it was as if I had told a racist joke or put on the cat equivalent of black face, and they were embarrassed for me! Pam’s Pictorama Photo Post: This French photo postcard shows a sprightly fellow who has had this hat (it was advertised as a sailor’s cap, I’m not sure about that) placed jauntily on his head. He appears fairly divorced from this fact – and instead has his gaze fixed on something (we’ll never know what) off in the distance – something a wise cat photographer uses to keep the attention of his puss photo subjects we’ll assume. There is no date, although there is a studio mark in the lower left which appears to be DLG and 440/2. Oddly the back is addressed, Monsieur Robert Douet, but it bears no postmark, nor stamp so perhaps it was hand delivered? I can’t quite decode the faded message on the back. It appears to be bonjour petit yor Y Le-Cointre. So, something along the lines of Hello little one and a name. A French cat, you’d think he’d wear a beret. It’s an odd photo – the hind most quarters of the cat are cut off from view. Nice looking kitty though, bold stripes and a sweet face and it appealed to me. When I look close I almost think the hat looks more like it might belong to a jockey. I can’t explain what seems to be an age-old desire among some of us to accessorize cats. It is perverse – taking these animals which are essentially finely-tuned killing machines and being endlessly amused by plunking a sombrero or pair of eyeglasses on them. However, I’m the first to say it entertains the heck out of me. Bring on the Youtube videos! Years ago I had a feral cat, Otto (Miss Otto Dix, Pictorama readers know her story) who liked to curl up on my head at night and I would call her my cat hat. We were best friends, but I would have lost a hand or arm trying to dress her up. (I was tempted, but resisted.) I also had a great hope of walking her on a leash – she seemed to have an interest in the outside and we lived on the six floor of an apartment building so I thought she might like it. It was clear though that she could and would wiggle out of any collar or harness – and balked at the very idea, so we never tried. I was afraid of her getting loose. She taught me some hard lessons about the cat-human relationship. These days Cookie is too cranky to consider dressing up, and Blackie so perfectly distinguished I don’t have the heart to fool with his gorgeous dignity. Alas, I will never become the William Wegman of kitty set. Cookie and Blackie, awaiting dinner one evening. Pam’s Pictorama Photo Post: I feel the need to confide upfront that the image of this photo has been enhanced by the magic of Photoshop at the gifted hands of my multi-talented husband. (Yay Kim!) In fact, I wanted to confirm that it was going to be possible to bring out the image before I purchased it and he fiddled with the eBay scan first. Sadly, it is so light that it is hard to make out – although clearly the information exists in the image or making it darker would not improve it. The image is so bizarre and interesting however, that I couldn’t let it slip by and purchased it, so here we are. That bit of disclosure out of the way – wowzers! What odd photo indeed! 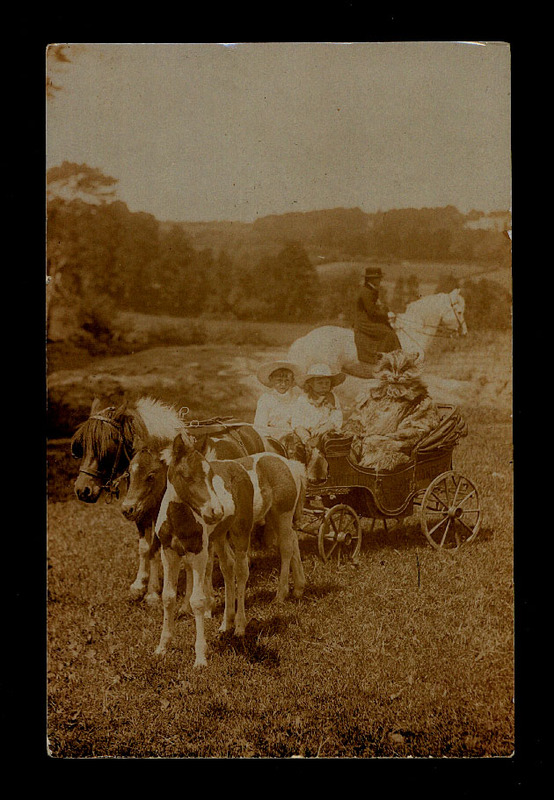 These very indulged children do not look especially pleased or entertained despite the glory of the scene, starting with that splendid horse cart, drawn by that perky pony and those two wonderful colts frolicking nearby. Then there is the handsomely dressed woman on the perfect white horse, riding side saddle – and the view which is something out of a Hudson River School landscape. But of course, what makes it all and has me stop in wonder is that outrageous cat costumed individual in the cart! A glorious costume which is so fluffy that he takes up the entire back of the cart. The mind boggles – did he dress up weekly or even daily for their entertainment? Was there a time when all wealthy children had adults dressing in animal costumes for their entertainment and I have just failed to hear about it? While I do not know their story, I can only hope that were I such a lucky child that I would enjoy it more than they appear to be. However, we will never know.